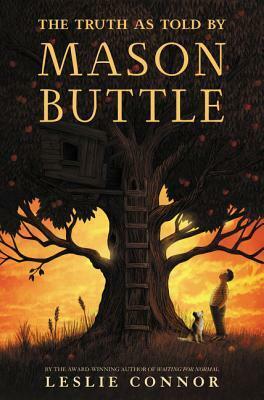 Mason lives in a "crumbledown" house with his grandmother and ne'er-do-well uncle Drum after the death of his parents in quick succession. Because the family is grieving and disorganized, the family orchard has fallen into disrepair. Mason has learning disabilities (as well as a condition that makes him sweat heavily) that make him a bit slower to process information, especially when writing, and the uncle has a young live-in girlfriend who does not contribute positively to the family dynamic. To make matters even worse, Mason's best friend, Benny, was killed falling off a ladder in the orchard, and the investigating police officer, Lieutenant Baird, believes that Mason is responsible and keeps badgering him to write an account of what happened, since Benny's two fathers are bereft. Mason is also bullied by a neighbor Matty Drinker who has his own problems. The saving graces of Mason's life are his resource room teacher Ms. Blinny, Moonie, Matty's dog whom Mason watches, and his new friend, Calvin. His friendship with Calvin starts off when the two are chased after getting off the school bus, but blossoms when the two discover an old cellar in the orchard and work to recreate cave paintings on the walls. Unfortunately, Calvin goes missing at one point, Lt. Baird thinks that Mason is responsible for his disappearance as well, and matters are brought to a boiling point before Mason and his family are able to move forward. Strengths: I love Connor's work, as did my daughter when she was in middle school. She comes up with interesting characters in unique situations, and makes their stories come alive with outstanding details. Mason is no exception. While his situation is sad, his attitude is upbeat. Ms. Blinny is fantastic, and the support that Mason gets at school is exemplary. All of the characters, whether completely pleasant or not, as fascinatingly drawn and intriguing. I enjoyed this one a lot, especially Mason's relationship with the dog, his growing friendship with Calvin, and his sad but eventually improving family situation. Weaknesses: The death of Benny, Lt. Baird's handling of it, and the eventual resolution were all SUPER sad, and perhaps a bit beyond the average middle grade reader's ability to understand. What I really think: This was a fantastic story that I may have trouble finding readers for in my library. Like VanDraanen's The Secret Life of Lincoln Jones (which I also enjoyed), there are a lot of things to recommend this story, but it's a bit long and slow for the majority of my readers.